In part 1 of my T-shirt series, I fitted and adjusted the pattern for the T-shirt. 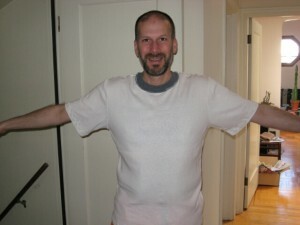 In this installment, I see how well it fits by making a “muslin”, in this case a T-shirt out of fabric I won’t cry much over if it doesn’t work out. 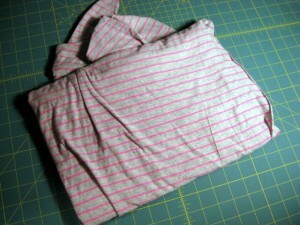 I have this cut of heather gray jersey knit with hot pink stripes. This entry was posted in Fabrics, Knits, Sergers, Shirts on April 28, 2013 by mportuesisf. Here’s where I’m at with each of my three projects. The write-ups on PatternReview.com say this pattern runs large, so I traced the Small version of the pattern and I plan to hope for the best. Unlike most other reviewers, I will be including the MP3 player pocket (hereafter referred to as the “smartphone pocket”). The front has two different pockets, side panels and a yoke front, so this pattern has eight pieces for View E.
Instead of tracing this pattern, I simply purchased another copy from Joann’s for 99 cents when it was on sale. I’d much rather pay a buck then spend all that time messing around with tracing paper and a Sharpie. I chose the Medium size for this pattern. I have high hopes this will fit well, based on my positive fit experience with McCall’s 2447. The good news is that View A (the short-sleeve version) has fewer pattern pieces to deal with. Having made this pattern several times in the past, I knew I wanted to make some alterations for better fit this time around. The very first time I sewed KS3299, I traced and cut the Medium version of this pattern. The result was huge – across the shoulders, sleeves and around the chest. This entry was posted in Knits, Pattern Alteration, Pattern Fitting, Shirts on April 27, 2013 by mportuesisf. Well, thanks to weekend clouds, I’m still waiting to take my telescope caddy out into the field and try it out. But that doesn’t stop me from starting new projects. I have learned that April is National Serger Month, so I want to try some projects with my serger. I’m going to be working on three projects all at once. I have some light green argyle print knit fabric that has been gnawing at me, wanting to be made into a Spring T-shirt. 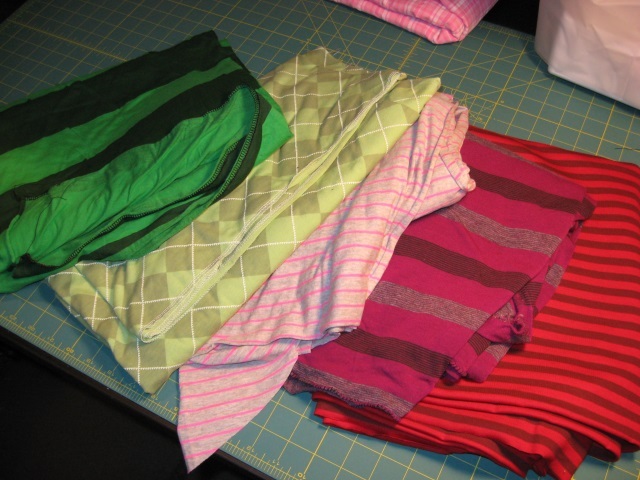 Plus I have some other cuts of jersey knits that have been sitting in my fabric stash. This entry was posted in Coverstitch, Knits, Patterns, Project Planning, Shirts on April 14, 2013 by mportuesisf. Today I finished my prototype telescope caddy, and got it ready for a night under the stars this coming weekend! Last time, I discussed how the extra-heavy eyepieces would prove too much for Velcro to hold the caddy onto the side of the telescope. I altered the design to use a new idea for a suspension mechanism: A “cap” that covers the top of the telescope. The inside-facing side of the cap provides the support needed to suspend the outward-facing side. Draw a pattern piece for the back side. Add seam allowance to the front side piece. 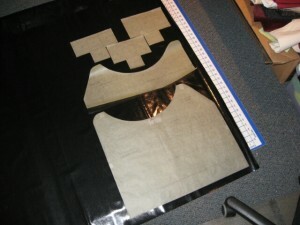 Redraw the pattern pieces for the bellows pockets, this time to better fit the eyepieces. Measure out two additional oilcloth strips to seam the inside to outside-facing piece. After all the pattern alterations, I measured and cut all the pieces from the oilcloth. (Click or tap photos for larger versions). This entry was posted in Bags and Cases, Completed Projects, Fabrics, Wovens and tagged Telescope Caddy on April 2, 2013 by mportuesisf.